There are four species of scarab beetles that are common in New England turf, fruit and vegetable crops. None are native to the US. Japanese beetles are the most common and widely distributed but Oriental and Asiatic Garden beetles are expanding their range and activity. 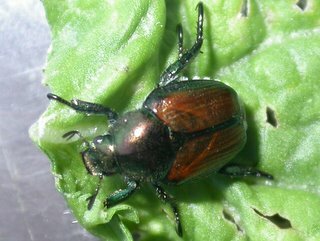 Japanese Beetles are active in early to mid-July in various crops and non-crop habitats. Oriental Beetles are also active and, though less damaging, may show up in vegetable fields as well. Below are descriptions of the four common species in New England. Adult Japanese Beetles are about half an inch long, with a metallic green head. The wings are shiny copper or bronze color, and there are a few tufts of white “fur” along the side of each wing when it is folded back over the body. The adults are active in daylight and feed on many different kinds of trees, fruit and flower crops. Fruit and ornamental plants are preferred, but beetles can congregate in vegetables also. In vegetables, adults can cause silk clipping in corn, and leaf damage in sweet basil, collards, other greens, green beans, eggplant, asparagus, rhubarb, and peppers. Though numbers may be high, there is no need to treat unless actual feeding damage is significant. In corn, if there are more than two Japanese beetles per ear and corn is less than 50% pollinated, an application may be warranted to reduce clipping and ensure adequate pollination. Asiatic Garden Beetles are about half as long as a Japanese beetle adult, and somewhat more “plump” or domed in appearance. They are reddish-brown or copper-colored. They often are found near roots of plants when one is weeding. Adults feed at night, so one may find damage without seeing the beetles. During the day they hide in the loose soil or mulch around the base of the plants. Scout with a flashlight at dusk or during the night, or sift through soil to find them. Larvae feed on beet, carrot, corn, lettuce, onion, Swiss chard, and strawberry. Adults feed on carrot, beet, parsnip, pepper, cabbage and turnip. Oriental Beeltes fly at night, but are very active during the day as well. The beetles are smaller than Japanese beetles, and usually are a rather mottled gray with black splotches. The pattern and color varies. The antennae are branched and are quite striking if you take a close look. Oriental beetles have a long flight period – through early August – and are very mobile. Adults tend not to feed heavily in vegetable crop foliage but show up in many crops. Grubs damage may be worse in drought years and in weedy fields, but is not commonly a problem in vegetable fields and crops, though this is not well studied. European Chafers are slightly larger than Japanese beetles and are a fairly dull brown or tan in color. They are night fliers but can be seen in large numbers just at sunset, when they congregate in large numbers in favorite trees (such as locust or willow). Adults are not foliage feeders and grubs are mostly a turf problem. The life cycle of the Japanese beetle fits most of the species of grubs we encounter in New England, with minor variations. They have a one-year life cycle, with adults emerging from the soil in early July in most of Massachusetts (later farther north) to feed and mate. The females burrow into the soil (often in or near wide expanses of grass or sod) to lay eggs which hatch into tiny grubs (cream-colored larvae, C-shaped, with brown heads) that feed on roots of grasses and other plants (especially corn). 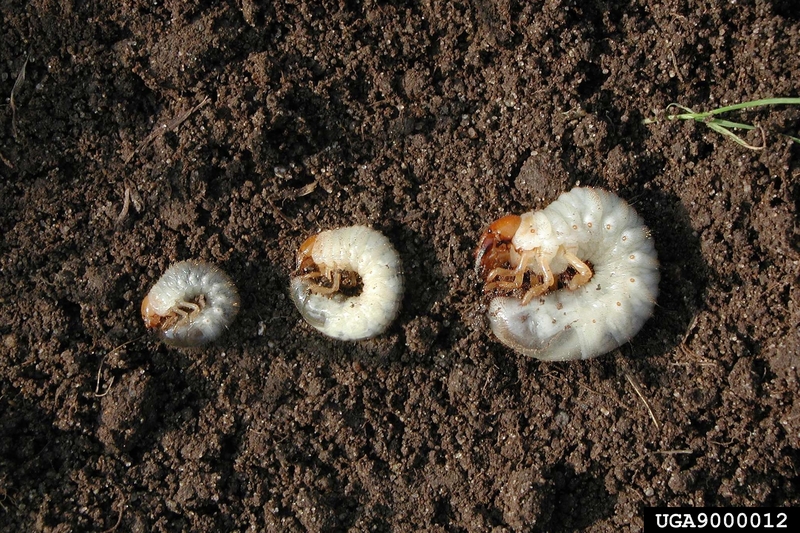 Grubs molt twice by the middle of September, and continue feeding until the soils begin to cool down. In late fall the grubs migrate downward through the soil profile, staying below the frost line throughout the winter. In the spring as the soils warm up, the grubs move back into the root zone and resume feeding for about six weeks. By the middle of June, most grubs have completed their feeding requirements and pupate (still in the soil) for about a week before emerging as new young adults. On turf, insecticide controls normally target young grubs just as they begin to emerge from eggs. In vegetables, managing the grub stage may not be feasible (or necessary) since the grubs are most likely feeding outside the field. Vegetable growers could run into problems with grub damage if turf or sod is plowed under in fall or spring and followed by a spring vegetable crop. A fallow or very weedy field may generate a hefty population of Oriental or Asiatic Garden beetles the following year. Insecticides may be needed to control adult beetles if numbers are high and damage is significant. The New England Vegetable Management Guide lists products for Japanese and/or Oriental Beetles in asparagus, basil, okra, and sweet corn. For controls in a crop where these beetles are rarely a pest and therefore not mentioned in the Guide, check the label of commonly used broad spectrum synthetic pyrethroids, carbamates, and neonicotinoids (as foliar spray). Organic options include neem products and pyrethrin. - R. Hazzard, adapted from Turf Management Update, Pat Vittum, Turf Entomologist, UMass, Beth Bishop, Michigan State University, Michael Seagraves, Cornell Cooperative Extension, and Ann Hazelrig, University of Vermont.